About a year and a half ago, I was in Barnes and Noble making my birthday and Christmas wishlist when I came across a book with a simply stunning cover. The book described a civilization with a finite number of souls, where people were reincarnated, time and time again over centuries. All was well until one mysterious night when a new soul was born, registering a blank on the technology that was capable of reading the souls of these people. I wanted to buy the book right then and there, but I was broke, so I added the book -- Incarnate -- to the top of my list. A running tradition in my household at Christmas is to see how many of my new Christmas books I manage to finish between Christmas day and New Year's Day. I finished Incarnate in four hours. I didn't get up to eat or drink or do anything else until I'd read the whole thing and pre-ordered the sequel, Asunder, which came out only a few weeks later. Then came the long wait for the conclusion, Infinite. 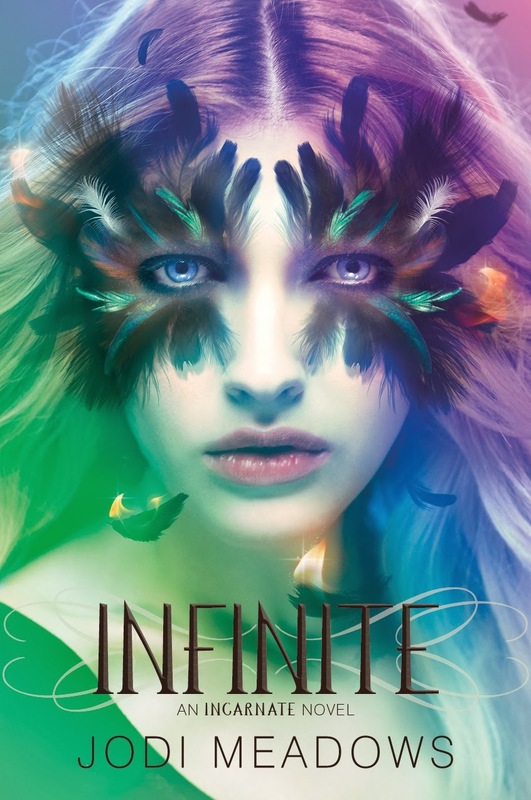 Infinite was the first series conclusion that I read since I finished Allegiant. If you've read my review on Allegiant (which was #13 in my Top 13 Books of 2013), you know that while I read and loved it and admire Veronica Roth for her bold choices, it just kind of destroyed my reading soul. I have always been a series-loving kind of reader. This is probably because I do not react well to change and I hate to see things end. With a series, I can find my ships and ship them hard. I join the fandoms. I follow Tumblrs and Twitters and belong to forums where I can discuss everything and speculate. I can even write fan fiction. In short: I can invest in a characters that have entrapped and enchanted me. With a standalone, it's hard for me to do such a thing. I'm the same kind of reader that I am a viewer. I love TV shows and watch all the seasons in a series over and over again. I can start the story over again and invest again over an amount of time. Since 2008, I cannot tell you when a season of Gossip Girl has not been in my DVD player or in my most recently played Netflix queue. (The only time it isn't is when I make the temporary switch to Gilmore Girls or Glee.) And I still ship Chuck and Blair HARD. CHAIR FTW. The point is, I love to invest in a series, but after I finished Allegiant, I lost my faith for a bit. I strayed from any series and read lots of standalones and reread a few books that I could count on. I started reading a series or two, but shied away from the second book. I started a half dozen books I haven't finished. I call this Allegiant-related-PTSD. But despite these fears, I braved the Polar Vortex and insane snow, despite having a horrible case of bronchitis so bad it was nearly pneumonia, to venture out for ten minutes to grab Infinite. To put it simply: Jodi Meadows restored my faith in books and the art of the young adult book series. The first two books in the Newsoul series paint a picture of a world in which all the things of fables exist -- dragons, trolls, centaurs, sylph, and the like. All this exists among incredible technology so precise that it can detect reincarnated souls that have been born. It has all the elements of a fantasy, yet so much of it has a quality of modernity about it. Between the first two novels, there was so much mystery and so many threads that were only beginning to weave together. Is this dystopian? Is this fantasy? Is this science fiction? And those questions were only the tip of the iceberg in a story filled with so many type of beings, a vengeful wannabe-deity, and characters who have lived hundreds of lifetimes. Infinite started out with the same fast pace which Asunder ended with. Jodi does an awesome job conveying emotion in her characters and keeping the plot moving without leaving any loose ends. You can feel the characters' emotions: their anxiety, their curiosity, and as the main character, Ana, starts to gain confidence in her abilities as a newsoul, you start to feel like you too could conquer the world and learn how to communicate and unite mythical beings using the power of music, or something equally as difficult. And I'm not normally a dragon person, but Jodi totally converted me. I love the intelligence behind their imposing and threatening facade. Like many YA love stories, the romance between Ana and Sam, an oldsoul, isn't without its struggles. But as opposed to the tried-to-death love triangle, they deal with things that I believe are just as real, like the question of when to tell someone something that may hurt them and when to protect them from a difficult truth, and the consequences when these secrets are revealed. I found their love story to be beautiful and their love scenes to be gorgeously written and tasteful. When the history of Heart and the planet is revealed, it turns out that the story does have both dystopian and fantasy elements at its core. The possibility that this planet they live on is the one the that we walk today feels very real, like it's a glimpse into what future could be. This makes it totally unique in a way that no book or series I've read is. Without spoiling too much, at the end of Infinite and Ana and Sam's quest, Ana is faced with a choice that affects the future of the civilization of Heart and all its inhabitants, both old and newsouls, who may never again get to be reincarnated. There is another series I've read that dealt with this issue, particularly in regards to the male and female protagonists, who had been chasing each other through different lifetimes. There was an agony at the end of this other series in wondering whether or not these two characters would once again find each other and the conclusion was wholly disappointing, disheartening, and frustrating. 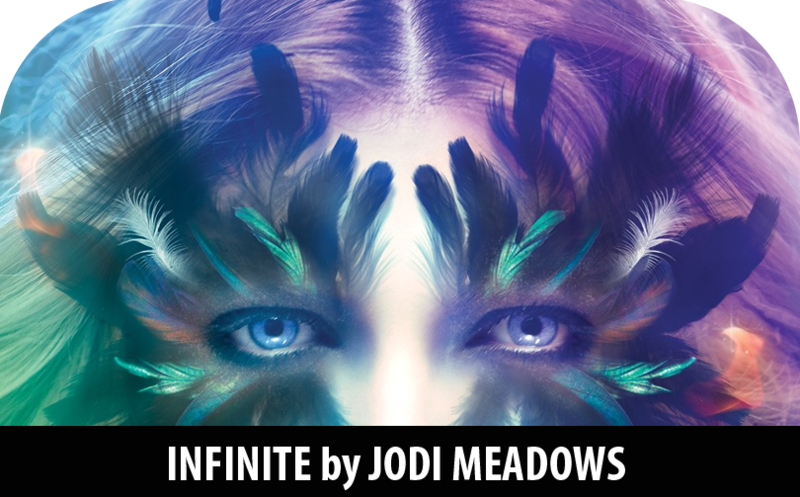 Faced with the similar challenge, Jodi conquers it and ends Infinite and the Newsoul trilogy in a way that will fulfill fans and leave them satisfied. With the ending, I find myself experiencing much less Allegiant-related-PTSD symptoms and am once again able to enjoy and finish books without (much) fear. On a somewhat separate note, during the days before Infinite's release and in the days after it, I was NOT a happy camper. I was horribly sick and on bed rest with a fever for almost ten days straight. I was bored, cranky, and frustrated. Jodi herself took it upon herself to send me some awesome autographed Newsoul swag (bookmarks, etc.) and it really brightened up my day. So a big thank you goes out to her for being so awesome and making me feel like more than just a reader and more like a friend. She's all kinds of awesome!